There are so many ways to “Say NO to Cockroach Infestations with Pest Control that Rids them of Your Home”. You can call us to come in and spray your home or do some research and find ways to get rid of them yourself. Either way it does take time and patience and repetition they are not going to go away on their own. You can search online for commercial strength chemicals that you can purchase online. Doing this is fairly cost effective and when applied with good cleaning and maintenance is the best way to go. Most things you will read will tell you to also use a growth regulator to keep the roaches from breeding. When they can’t breed they can’t repopulate. If you simply don’t have the time to deal with your own pest control you can hire a pest control company. In doing this you will want to make sure that they not only treat for the roaches, but that they also use a growth regulator to keep them from breeding and repopulating. This option will also only work if you keep your home clean, keep the counters and tables clean and stop giving them a source of food and water. All in all once you find a way to effective treat the infestation in your home you will have found a way to eventually get rid of them. All of these methods will work to either control them or rid your house of them. With that being said you will have to do keep up with your home to keep them away. Keep your home clean from trash, piles of books and paper and keep all food and water sources for them reduced to a minimum. Don’t leave dishes in the sink overnight, take out the trash regularly, sweep, mop and vacuum your floors regularly. Roaches love to hid in, around and under furniture, appliances and electronics where it is warm and space is tight. Do not let trash and other belongings pile up around your home and yard. Take your trash to the road for pick up weekly, keep out door furniture neat and tidy, and don’t use your yard for storage. Keep the lawn mowed, weeds pulled and all shrubbery trimmed and maintained well. And keep trees, bushes and shrubs away from the exterior walls of your home. Don’t let vines over run the exterior walls and windows of your home and make sure that all your windows close properly and screens fit well like they are supposed to. Whether you hire a pest control company to spray, or you find a good chemical to spray yourself you really should use a preventative pest control method. Keep the pest control on a routine. Spray around the exterior of your home. Routinely spray around all doors and windows. Keep it routine such as every month or 3 months. 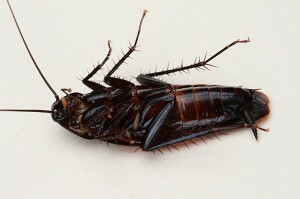 In the end you can “Say NO to cockroach infestations with pest control and rid them of your home” by not giving them a chance to move into your home. Treating and removing the infestation is no fun. It doesn’t happen over night and can be costly depending on the route that you take. Cockroaches spread disease and illness just by touching a surface. Make sure to keep all counters and tables clean and clear. No one wants an infestation of cockroaches. Once you see one, there are a hundred more hiding where that once came from. Cockroaches can cause expensive damage to many things in your home. They can make people sick with their transmission of a variety of disease and illness that are no fun for anyone to have. Cockroaches are dirty and embarrassing creatures. No one wants to live with them or be judged for living with them. Just always remember that keeping a growth regulator to keep them from reproducing. More information about cockroaches can be found HERE.